I have friends that have relationship issues! I fancy myself as a fairly gifted listener when I want to be; so when a friend is in the mood to share I usually try to make myself available. One thing I have come to realize is relationship issues never go away. One person’s issues simmer down then the next person’s drama flairs up. There is obviously a reason soap operas have been so successful for so many years. I have friends that have relationship issues; you have friends that have relationship issues; I have relationship issues; you have relationship issues. Just when you think you’re out of the rough waters and you’ve reached smooth sailing somebody comes along and rocks the boat. It’s inevitable! If you’re breathing, you or someone around you is having issues. The question is not whether you will or will not have any relationship issues. The question is when you have them. Remember, if you’re breathing, you have issues. I love the picture above because it reminds me that having issues is not such a terrible thing. Having issues is part of life. The mistake isn’t in making mistakes. 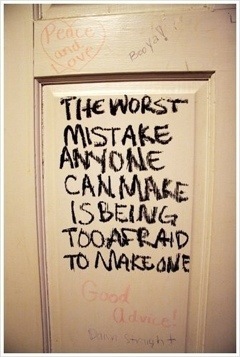 The mistake is in not having the balls to make the mistakes. The mistake is in thinking life has to be perfect all the time. The mistake is in being too afraid to leave a bad situation. The mistake is in being too afraid to voice your opinion because you’re afraid somebody might tease you behind your back. The mistake is in burying your gifts and talents in order to guarantee you will never realize your dreams. The mistake is in hiding from your true calling because it makes more sense to stay in your secure job. The mistake is in settling for anything less than living life without any regrets. Even though some of my friends are going through difficult times in their relationships, I applaud most of them who are dealing with their issues. They are taking chances. They are willing to make a decision to do what is right for them. They are taking ownership of their own destiny. Taking ownership of your own destiny isn’t always easy. Sometimes its easier to stand in the shadows of a bad relationship and blame the other person for your unhappiness. Or blame them for hurting you. Or blame them for standing in the way of you realizing your dreams. Truth be told, you are responsible for your own dreams. Nobody stands in your way of reaching your highest potential but you! Any objection you have otherwise is simply excuses. Oh trust me, I’m learning that about myself too. Like I said before, words don’t just jump on the page because I like to fancy myself as a writer. It takes dedication, determination, and true grit to chase after your dreams. Sometimes I think most of all, you have to be stubborn as hell in order to get where you want to go. There’s a certain air of stubbornness in those that are determined to push through the fear and be willing to make mistakes. How stubborn are you? Are you willing to risk making a mistake and push through your fears? What’s holding you back from taking that new job, or moving to that new destination, or changing your relationship status, or finding the peace you desire, or pursuing your dreams? Life is about making mistakes. The old saying goes, “He who dies with the most toys, wins.” I think it should be twisted around just a bit. “He who makes the most mistakes, wins!” If you’re making mistakes, at least you’re not stuck! If you’re making mistakes, at least you’re trying! Previous Did I Shave My Legs for This??? Next Your Flow Has Got To Go!! Good point Jimbo! But remember, some of us are more stubborn and take longer to learn than others. Sometimes we can’t help but repeat the same mistakes until we finally wake up. T, you have always had a way with words and explaining your thoughts in a very non-judgemental un-bias way and i want to thank you for that…your are a great person and an awesome friend. Keep it up.. Thanks for the kind words LucASS!! See you in the morning bright and early! !